Week Two of the 2014 NFL season begins with the Pittsburgh Steelers traveling to Balitmore to meet the Ravens on “Thursday Night Football”. 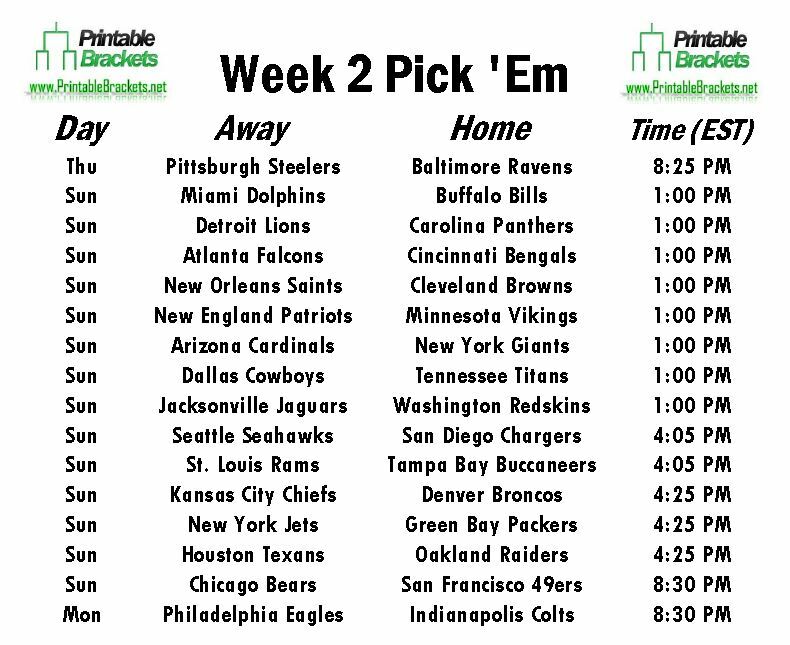 A full slate of games is on the 2013 NFL pick em Week 2 sheet. You can get the printable sheet and get your office pool in motion for free right here. The second Thursday Night Football game of the new campaign has the bitter AFC North rival Steelers and Ravens squaring off in Baltimore. As last year’s defending Super Bowl champions, the Ravens finished with a record of 8-8 a season ago, which included a 19-16 loss at Pittsburgh in Week 7. However, the Ravens held on for a 22-20 win over the Steelers last Thanksgiving night. There are a number of other notable games on the NFL pick em Week 2 sheet. In early Sunday action, the New York Giants will open the home portion of their schedule against the Arizona Cardinals. The Dallas Cowboys will go on the road to take on the Tennessee Titans, while Cam Newton and the Carolina Panthers will host Calvin Johnson and the Detroit Lions. In late action on the NFL pick em Week 2 sheet, the defending Super Bowl champion Seattle Seahawks will travel to San Diego to square off with Philip Rivers and the Chargers. Also Sunday afternoon, Peyton Manning and the Denver Broncos will welcome the rival Kansas City Chiefs. A pair of longtime NFC powers will hook up on “Sunday Night Football” when the Chicago Bears head to San Francisco to face the 49ers at the new Levi’s Stadium. The final game on the NFL pick em Week 2 sheet features a meeting between Andrew Luck and the Indianapolis Colts and Nick Foles and the Philadelphia Eagles on “Monday Night Football” in Indy.